Blockchain is a database. The significance is that it is one which is immutable, tamper proof. This is achieved by data inputs being hashed and moved together into "Blocks" of data, with a subsequent Block having new data inputs along with the input from the previous Block. As a result, each Block is dependent upon a previous Block, hence a “Block-Chain”. Data is “hashed”, which means it is converted into a representation of a given length which will appear meaningless. However, the smallest change to any data will change the output hash completely. Since each Block contains hashed data, changing any input will change every subsequent output which means tampering is impossible. The second key point is that copies of this Blockchain are held on multiple servers. So, it is a decentralised database. It is not held on one machine. Since it is decentralised, changing a record on one server will no longer match the others. One would need to change all the servers’ data at the same time. So, combine the Chain of Blocks, with this decentralised system and you have a way to hold data in a way which is tamper proof and 100% reliable. 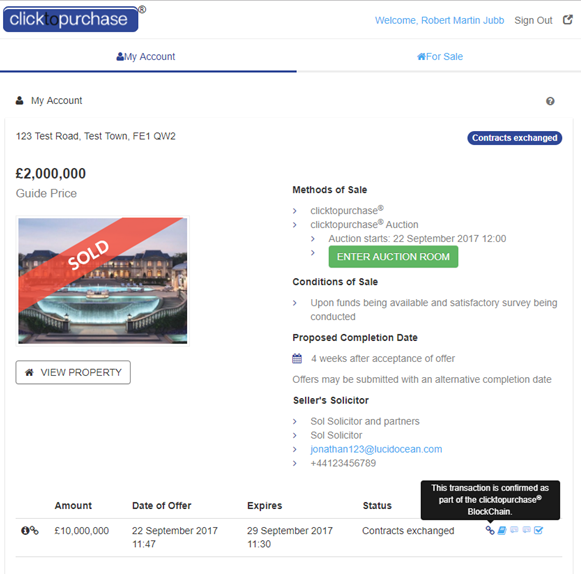 clicktopurchase® uses hash and encryption technology to record the Bidder verification process, offers submitted, offers accepted and the formation of online digital contracts. Since all events are now recorded in the Blockchain ledger, absolute proof of actions are recorded in a tamper-proof manner. For example, if you have exchanged contracts with clicktopurchase®, you have undeniable proof that you have entered into a purchase contract. A layer of security, transparency and accountability which is unavailable elsewhere. 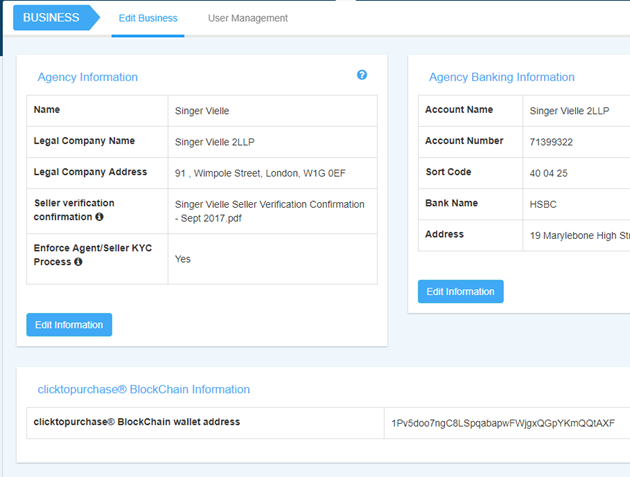 Each Block contains the "transactions" recorded within the ledger. A "transaction" can be any action undertaken during the course of a clicktopurchase® sale. Hence, a verification action, offer, acceptance or contract exchange. 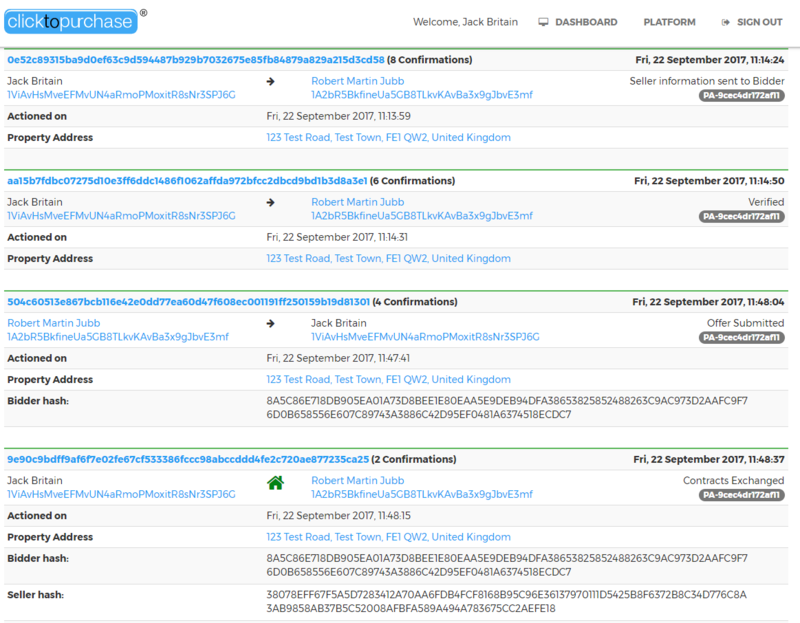 Each transaction has a unique identifier, showing the movement of the “transaction” from one party to another. 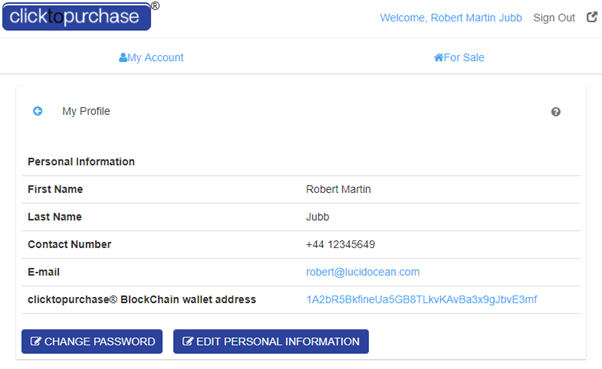 Each party to a transaction has a unique digital Wallet Address. 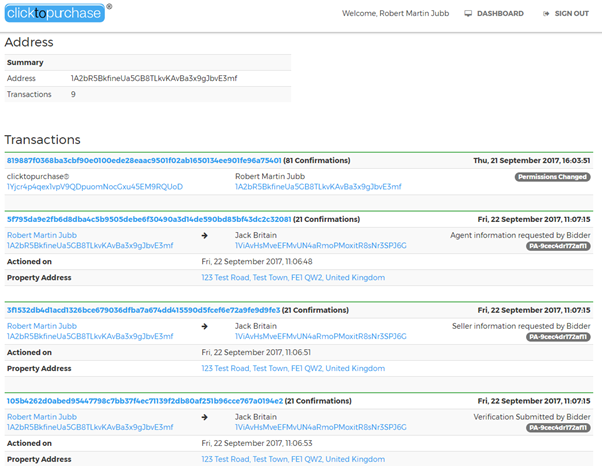 Searching the Blockchain with the Wallet Address will display all recorded transactions. 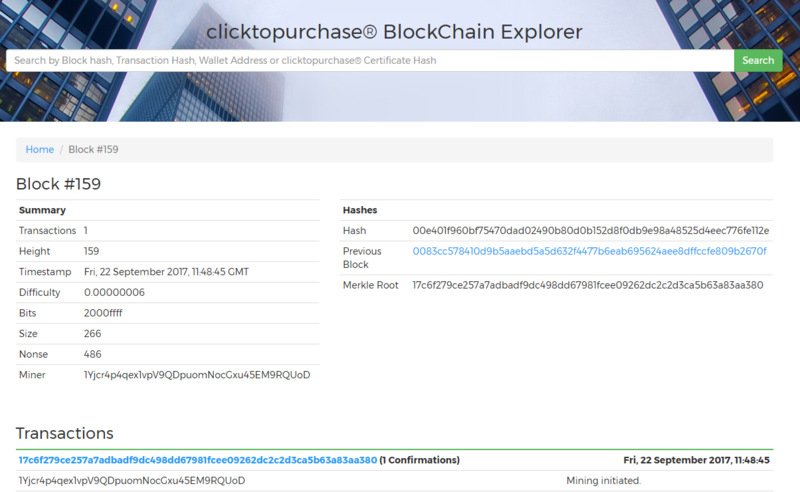 This search can be actioned from the clicktopurchase® Blockchain Explorer, or simply by clicking the wallet address link in My Account. 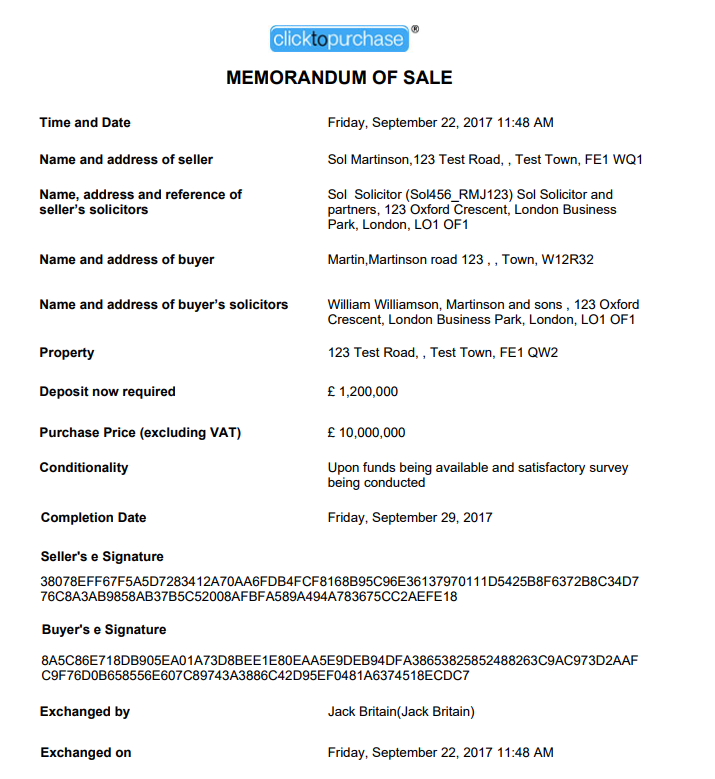 Here is an example of the transaction list for a user. 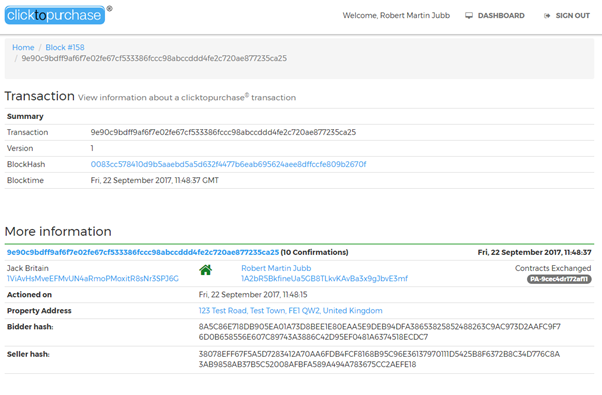 If you were interested to see all transactional activity relating to a bidder, this can also be easily seen by either pasting the Bidder’s wallet address into the Explorer, or clicking the link in a verification area. This then displays all the transactional history relating to the Bidder, identified by their digital wallet. 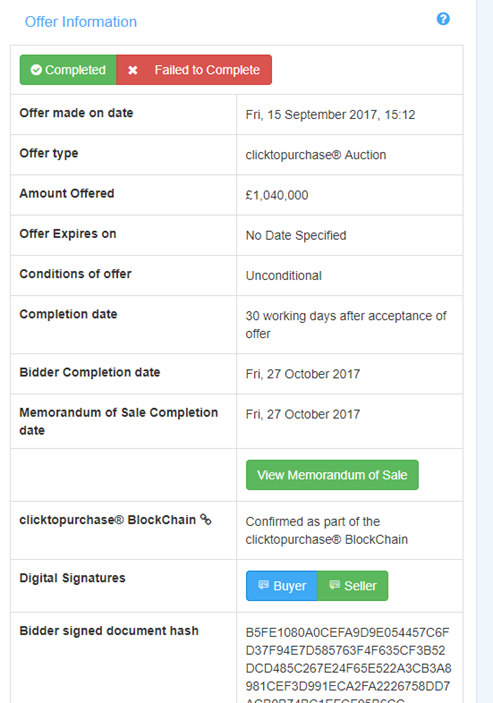 You will see that a Bidder’s Hash and a Seller’s Hash recorded in the Blockchain are the same as those represented on a digital contract created when a clicktopurchase® offer is accepted. There are a number of places where you can find your digital Wallet in order to track your transactions in the clicktopurchase® Blockchain. If you are accessing clicktopurchase® from an agent’s website, go to My Profile by clicking your name. 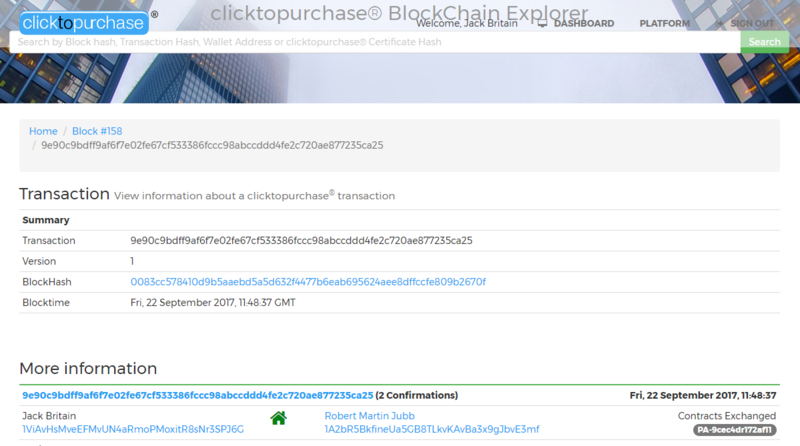 If you click your Wallet address, you will be taken to the clicktopurchase® Blockchain Explorer where you can see your list of transactions. Or, you can log in at clicktopurchase.com and go to Edit Profile. Clicking your Wallet address will take you to the clicktopurchase® Explorer where you will see your address and all your transactions. 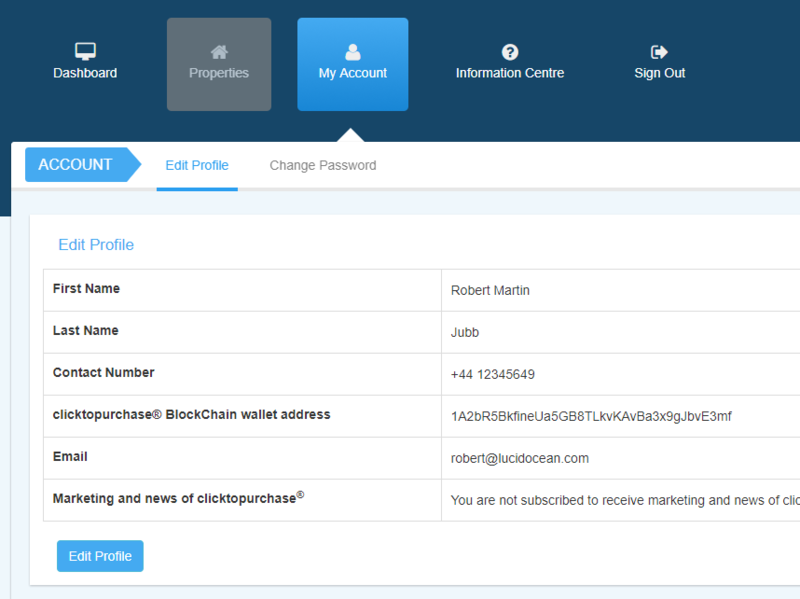 Should you wish to find a particular transaction in the Blockchain, go to My Account. 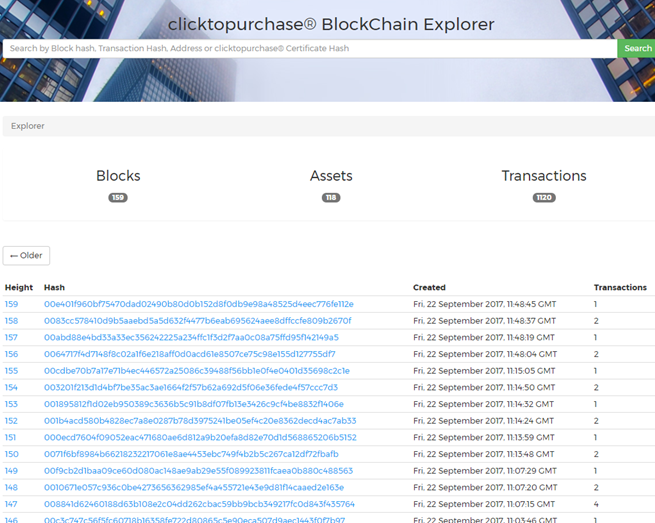 Here you will see a link which on clicking will take you to the particular transaction in the Blockchain Explorer. 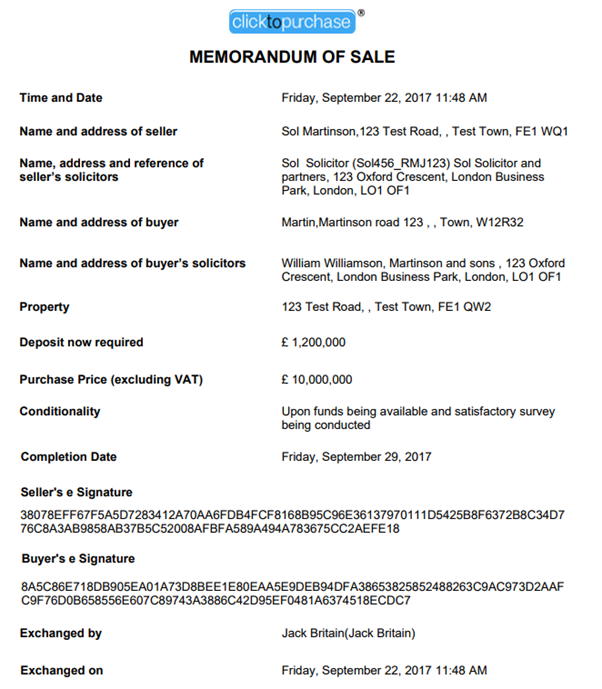 You can see that the Bidder Hash and Seller Hash match those on the digital contract. Thanks to the clicktopurchase® Blockchain, no one can ever challenge that you applied for verification, submitted an offer, and exchanged a contract when your offer was accepted. All your actions are recorded and can be found in the Blockchain. You have absolute and total proof. This adds a layer of security and trust to our platform which is unavailable elsewhere.